Fakes have been plaguing the Blythe community for quite a while now, and since I first blogged about them back in early 2011 there hasn’t been any end in site. There’s been quite a few names thrown around for them. Factory dolls, clones, fakes and, the ever so popular, “TBL”. Whatever you want to call them, they are all fakes in comparison to Blythe. Let’s examine each of these ‘names’, as there’s subtle differences between them – and yet none of them are legitimate Blythe dolls. Factory doll, photo by Meg/irulethegalaxy. Factory dolls are allegedly dolls made of rejected parts from the official factories that produce Blythe. Rumour was that these parts were rejected or parts that were smuggled out of the factories by workers and then cobble together to make a Blythe. People ended up with dolls that had the same special chips as certain dolls, but then the face-up of another recent release. Since factories have been moved, there’s been less and less ‘factory’ dolls seen in the market. Security must have been tightened up a bit there! 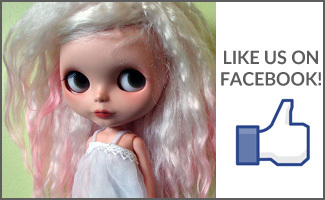 Clones, to me, are dolls that mimic Blythe but aren’t necessarily marketed as being Blythe dolls. These include Icy, Blybe, CCE (Color Changing Eyes) and Basaak dolls. These dolls tend to be much cheaper than Blythe, but lower quality in construction (a possible exception could be made for Icy dolls). Blyth is also a ‘clone’, but are smaller in size (closer to a Middie size) and have a poorer body quality in comparison to Blythe or Middie. Clones are the ones I consider the easiest to tell apart from real Blythes due to obvious facial differences or the obvious differences in body quality. 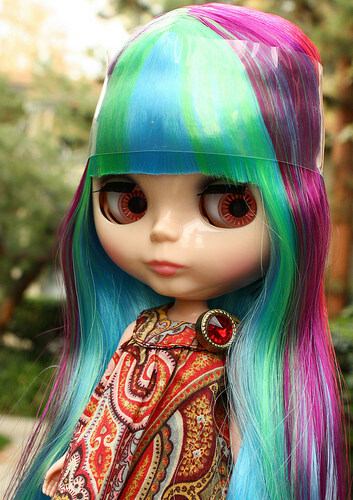 Customized TBL with Saffy scalp, photo by Jen/Blythe Spa. TBL = Taobao ‘Blythe’, after their website of origin. TBL was a quaint term coined originally by Dr. Blythenstein back in 2012 when these dolls first appeared on the market. As far as fakes go, they’ve probably been the most imaginative. 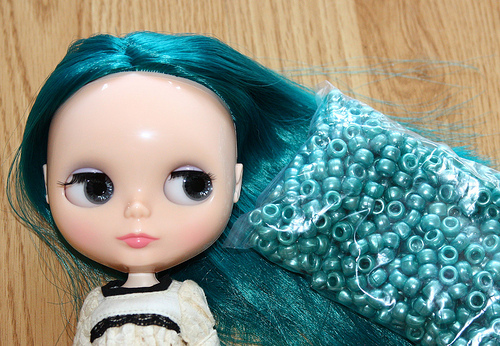 At the beginning, a lot of them looked like standard stock Blythes – similar make-up, very similar hair colours and styles – but since then, whoever makes TBLs have been churning out far more creative hair colours and even eyechips. From rainbow to glow-in-the-dark, TBLs have been pushing the envelope on what they’ve been producing and the community has responded in kind. A lot of people have said that TBL parts are interchangable with Takara, while I recently read that the special TBL eyechips were the wrong size for a stock FBL eye mechanism. So mix-and-match dolls at your own risk. Uncustomized TBL, photo by Meg/irulethegalaxy. In a way, it seems like a ‘good idea’ of these TBLs and other fakes to be out there. They pushed the issue of more creative doll designing and Takara has seemed to respond in kind (have you seen the promotional illustrations for Mandy Cotton Candy and Yellow Marshmallow?). At the same time, having fakes of any kind flood any market cheapens the hobby as a whole. Dolls of any kind, especially Blythe, is a luxury. Nobody needs an anniversary doll to survive. And as luxuries go, it’s an expensive hobby. Customizers, new and old, may find the TBLs to be a welcome addition to the hobby because it makes for a potentially cheaper source of base dolls instead of needing to purchase legitimate dolls. And at the same time, if there’s a dip in sales, Takara may continue to create ‘safer’ designs that they know will sell, which would ultimately push more collectors to the wacky and creative world of TBLs. There seems to be a division, as it were, when it comes to the fakes. Those who have no issues owning a fake or customizing one, and those who think that there shouldn’t be any. Regardless of what you may think, fakes seem to be here to stay. Is a Blythe still a Blythe if it wasn’t made by Takara? Hello there :). I’m new to this hobby (I bought my first blythe, an Orange and Spice last year), so I don’t have the knowledge or experience of you. I read your blog for a while and I was not sure about commenting one of your posts, but this one interested me a lot, because when I started on this hobby, I had no idea about factory, fake, etc, etc, etc, I though there was just original dolls and nothing else. Factory blythe are made of different parts of blythe dolls, but these parts are come from Takara’s factories. So, they are blythe, but they are just done of rejected parts. Icy, blybe, basaak and CCE, it’s notorious they are fakes. They have smaller similarities with blythe dolls, yes, are big headed and have enormous eyes, but you know they are not blythes and the quality will probably be poor. For me, it’s different for “Taobao Blythes”. They are not from Takara. They looks exactly like one, but it’s not the same. They are cheaper than Takara dolls (and it’s a fact, most of these taobao dolls have better quality than some new releases and their design is way more creative than Takara’s). If you want to learn to how to customize (like me), it’s better to use for practice a factory of taobao doll, instead of ruining up a takara doll. But TBL dolls are not from takara. And it’s sad to admit, if they are not created from Takara, they are just a better clone (and I like some Taobao girls a lot…). Hi! 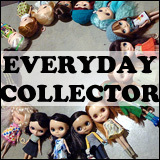 My two cents on the matter … I don’t consider myself a collector, but I am familiar with collecting. To me, Kenners are the only dolls will ever truly be Blythes worth collecting, if that is all that is important to you. True some Takara models have increased in value, but I doubt they’ll ever be in the same league as the Kenners to those real collectors out there. Of course, most of us in the hobby are more enamored of the creative potential these dolls possess. The clones, fakes, etc., have opened up the hobby to many who couldn’t afford to practice customizing on an expensive doll. Some of us can even surprise a small niece with a dolly that looks like their auntie’s coveted Takaras, but is cheap enough to actually “play” with. I own a Takara, a Middie Takara, an ADG and what we’ve come to call the “mystery clone.” I also own a custom Blythe bought on the secondary market, and I have no idea what base she is. I love all of these dolls. Of course, most of them have had their bodies replaced with Liccas and Pure Neemos. I’ll admit it, I just like to create clothing and crafts for them and take fun photos. It’s a hobby and it takes my mind off of the cruddier aspects of my life. So, I don’t think the fakes or clones will hurt the market. I do think, however, collectors will have to be on their toes and know their stuff before buying. I agree SonjeB. The only true collectible Blythe is a Kenner. Lets think about this. Look at Vintage GI Joes, they had clones as well and repops in the 80s as well as other scales. Barbies as well. The original GI Joes have stood the test of time and continue to bring top dollar. With Barbie?… Well lol I have been duped into buying the “collectors editions” of barbie (Bob Mackie anyone?) and later, years later finding they are worth 15.00-25.00… I still covet the original vintage Barbies though and will prob never own one because unlike the GI Joes mentioned earlier the bubble will prob not burst on that market for many many years since it isnt completely dependent on nostalgia of grown ups that owned one as a child. Kenner Blythe, I think, will see the same longevity in top collector value. If you are not collecting the true original first run of something with goals in mind like new old stock.. or completing a vintage set with box… you aren’t a collector in terms of investment. You are a hobbyist. Im ok with both, but not at all confused about the difference in the two. Good to know. I was wondering about all the differences. I am not a collector. I think the customized dolls are super sweet. 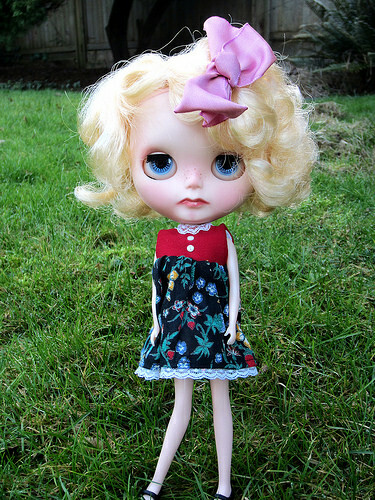 And while I would never pay the price of the real Blythe doll. I do like to craft. Just got two jointed Icy dolls to carve for my daughters to play with. I am very impressed with the quality and the ease of carving. I may be persuaded to carve one for myself too. 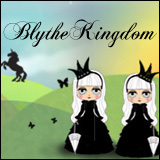 Hi, Which Blythe clone is completely unmarked? ?